285 - Dyarchy - Roman Empire partitioned in two when Emperor Diocletian appoints Maximian as a sub-Emperor (Caesar) to rule the western half of the empire, while he continues in the east. Maximian is elevated to full co-emperor (Augustus) the next year. (1) Prefecture of the East (capital: Nicomedia) ruled by Diocletian (augustus). (2) Prefecture of Italy (capital: Milan) ruled by Maximian (augustus). Covered Italy and west Africa. (3) Prefecture of Illyricum (capital: Sirmium) ruled by Galerius (caesar), subordinate to Diocletian. (4) Prefecture of Gaul (capital: Trier) ruled by Constantius Chlorus (caesar), subordinate to Maximian. Note the West Roman Empire is henceforth ruled from Milan (Mediolanum). The city of Rome remains the official (but unused) joint capital of the tetrarchy. - the Tetrarchs (statue in Venice). 312 West Roman Emperor Constantine I ("the Great") converts to Christianity. According to legend, he was converted while marching with his troops to battle, when he noticed a vision of a cross in the sky, with the inscription "In hoc signo vinces" ("In this sign, conquer"). 313 - Edict of Milan jointly issued by West Roman Emperor Constantine I and his brother-in-law East Roman Emperor Licinius, ending the persecution of Christians. Property is restored and profession of Christian faith made legal. Around this time, Constantine donates the Lateran Palace as a residence for the Bishop of Rome (Pope) and builds the Cathedral of St. John Lateran (the 'mother church') beside it. 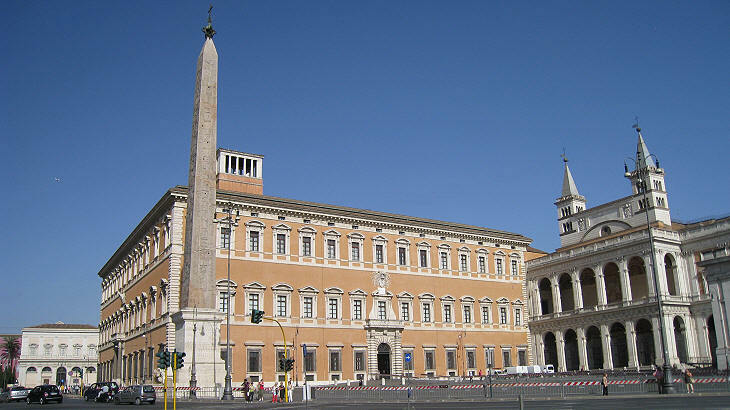 Lateran Palace now (palace on left, side entrance of St. John on right). 314 Council of Arles - condemns the doctrine of Donatism, a puritan disciplinary doctrine popular in Africa that asserted that sacrements and consecrations administered by sinful priests were invalid. This is particularly troubling to the orthodox Christian clergy who, during the prosecutions of Diocletian, had to hide or renounce their adherence to the faith ('apostasy'). 314 First Council of Ankara - sets the terms for reconciliation of ex-apostates with the church. The sacrament of penance is outlined here. 318 Arianism. Patriarch Alexander of Alexandria excommunicates Arius, presbyter of Baucalis, for preaching a christological doctrine that asserted that God the Father and Christ the Son were "made of different substances", thus implying that Christ was less-than-fully divine (and thus could be worshipped as a demigod). 324 - Constantine I defeats Licinius. End of the tetrarchy experiment and reunification of the empire under one ruler. Milan remains the effective capital. 325 - First Council of Nicea (First Ecumenical Council) - assembled by Constantine. Arianism is condemned as heretical and the first "Nicene Creed" (assertion of conventional Christian doctrine) is drafted. - Church fathers with the Nicene creed. 330 - Emperor Constantine relocates to a new capital in the east, Constantinople. This sets in motion the partition of the Roman Empire into western and eastern halves. 331 Arian clergy seizes control of Antioch and deposes the Nicene bishop, Eustathius of Antioch. 335-6 - Councils of Tyre and Jerusalem. Eusebius of Nicomedia, Arian sympathizer and confidante of the Emperor, convenes two church councils to formally readmit Arius to communion with the Christian church. But the new Patriarch Athansius of Alexandria, a radical anti-Arian, refuses to allow it and is banished to Trier on trumped up charges. Marcellus of Ancyra and others are also banished and deposed. 337 - Death of Constantine I, finally baptized to the Christian faith on his deathbed. Succeeded by his three sons who partition the empire between them - Constantine II in the west, Constans in the center (incl. Italy) and Constantius in the east. Under the influence of Eusebius of Nicomedia, an old comrade of Arius, Constantius will adopt and promote the Arian doctrine in his domains and persecute 'Catholic' (i.e. pro-Nicene) Christian bishops and priests. 338 Eusebius of Nicomedia becomes Patriarch of Constantinople. 340 - Council of Rome assembled by Pope Julius I to consider the matter of the exiled pro-Nicene bishops, like Athanasius of Alexandria and Marcellus of Ancyra. Arian Eastern bishops refuse to attend. Finding in the exiles favor, Julius I orders their reinstatement. 341 - Council of Antioch ("Dedication Council") assembled by the pro-Arian Constantius and Patriarch Eusebius. The homoousion clause of the Nicene creed (asserting Christ was "of one substance" with the Father) is dropped (Arians asserted they were different substances) and a semi-Arian "Creed of the Dedication" is drafted. 342/3 - Great Council of Sardica (Sofia) assembled by both Emperors to settle the Arian problem. Dominated by Western bishops, eastern bishops abandoned the council at held a rival pro-Arian one at Philippopolis (Plovdiv). The Sardica Council exonerates Athanasius and other pro-Nicene bishops, and excommunicates some of the ringleaders at Philippopolis. 347 - First Council of Sirmium (Mitrovica) assembled by Constantius condemns the ultra-Arian doctrine of two completely different substances. 351 - Second Council of Sirmium affirms the semi-Arian formula that Christ was "of similar substance" with the father. 351 - With the death of his two brothers, Constantius becomes sole ruler of the Empire. Immediately begins pushing the Arianism on the western half. 353 Second Council of Arles under Constantius's influence condemns the anti-Arian activist Bishop Athanasius of Alexandria. 355 Council of Milan re-condemns Catholic Athanasius. Athanasius is formally deposed as Bishop of Alexandria. 357 - Third Council of Sirmium with Arianism on the ascendant. Condemns both the Catholic ("one substance") and semi-Arian ("similar substance") doctrines and goes for out-and-out ultra-Arian ("different substances"), even going so far as to assert that the Father 'is greater' than the son, thereby reintroducing the concept of the demigod ("Blasphemy of Sirmium"). Council of Ankara under Catholic Bishop Basil of Ancyra issues statement with the "one substance" doctrine suggeted, thus temporarily arresting the slide to full-blown Arianism. 358 Fourth Council of Sirmium overturns Ankara, but steps back from ultra-Arianism, and only allows that God is "similar" to Christ (in "will", not substance). 359 Council of Rimini (in west) and simultaneous Council of Seleucia (in east) are assembled by Emperor Constatius to confirm the decisions of the Sirmium IV. in effect reverses the Nicene council and establishes Arian Christianity as the 'correct' version of Christianity. 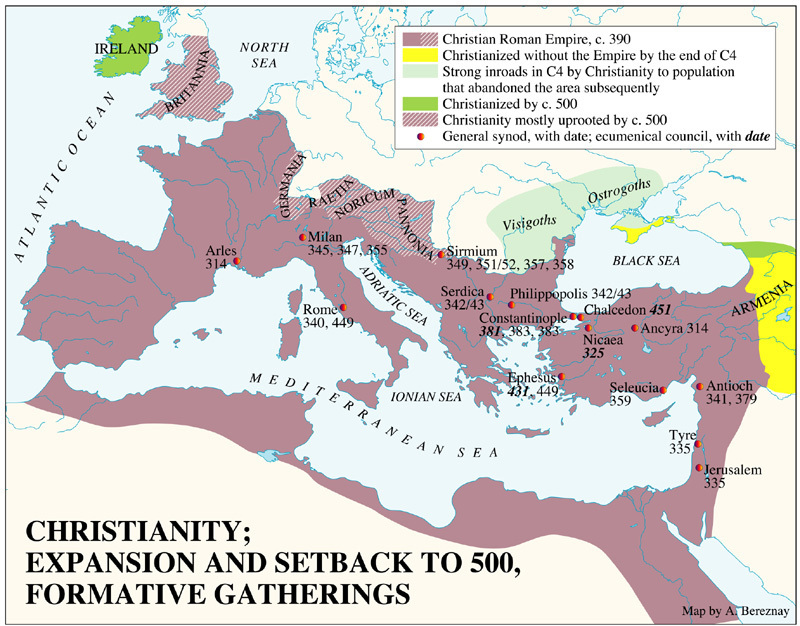 It is around this time that Arian Christianity will be adopted by practically all the Germanic tribes on the Roman frontiers - Visigoths, Ostrogoths, Vandals, Alemanni, etc. 360 Council of Constantinople convened under the leadership of tdhe Eusebius's succcessors, Eudoxius of Constantinople and Acacius of Caesarea, confirms the semi-Arian findings of Rimini-Seleucia. The Nicene council is declared void, over the opposition of the orthodox clergy. stops promoting Arianism. Catholic clerics persecuted under the previous regime are allowed to return to their posts. 364 Death of Emperor Jovian (Julian's short-lived successor from 363). Empire re-divided between two brothers - Emperor Valentian (West) and Valens (East). 374 - Ascension of Archbishop Ambrose of Milan. A highly influential theologian and activist, St. Ambrose will be instrumental in bringing the Roman Empire back to Catholic Christanity and driving Arianism out of the empire. 375 - The Huns, a Central Asian tribe, reach the shores of the Black Sea, defeating and subjugating the German tribes there (Ostrogoths, Gepids). With Emperor Valens's permission, tens of thousands of Visigoths, fleeing the Hunnish horde, cross over the Danube and settle within the Roman Balkans. 378 - Relations between Romans and Gothic immigrants sour and a war between them ensues. Romans are decidedly defeated at the Battle of Adrianople. Valens is killed and the Goths proceed to ravage the eastern Roman empire. Succeeding Valens, a Catholic Christian general ascends as Emperor Theodosius I 'the Great of Eastern Rome. Western Rome remains under the control of Valentian's successors, co-emperors Valentian II and Gratius. 381 - First Council of Constantinople (Second Ecumenical Council) convened by Theodosius I, under the leadership of St. Ambrose of Milan, establishing Catholic Christianity as the only Christian doctrine. The Council condemns Arianism and assorted other doctrines as heresy, reinstates the Nicene Creed and finalizes the doctrine of the Holy Trinity (divinity of the Holy Spirit confirmed). 382 Synod of Rome convened by Pope Damasius I to promote the resurgence of Catholic Christianity. The Latin translation of the Bible (the 'vulgate') by St. Jerome of Antioch is commissioned here. 382 - Gothic war ends. Visigoths established as Roman federate tribe and allowed to settle on Roman territory south of the Danube. 391 - Theodosian decrees closing temples and prohibiting pagan worship in the Roman Empire. Catholic Christianity is now official Roman state religion. 392 Death of Valentian II of Western Rome, the last Arian emperor. Theodosius I of Eastern Rome annexes the Western Roman Empire. 395 - Partition of the Roman Empire. Death of Emperor Theodosius I. Empire partitioned between his two young sons: Honorius (Western Empire) and Arcadius (Eastern Roman Empire). This partition will remain permanent. The reign of the young sons will be dominated by military strongmen, Stilicho in the west and Rufinus in the east. The rivalry between the latter two will bring the empires into war with each other. 395 - Still pressed by the Huns and seeing the empire in the hands of two inexperienced youngsters, the chieftan Alaric of the Visigoths (then in the Danubian borderlands) breaks his federate treaty with Rome and moves further inside the empire. He goes on a campaign ravaging Thrace and Greece, meeting little resistance from the disorganized and fractious Roman regents. 400 - Continuing their campaign of plunder, Alaric's Visigoths invade Italy, plunder the Po valley. The imperial residence is moved from Milan to Ravenna. 402 Ravaging Visigoths are finally defeated by a Roman army led by Stilicho at the Battle of Pollentia (in Piedmont) and then again in a follow up battle at Verona. Alaric leaves Italy in 403. Stilicho will subsequently co-opt the Visigoths and deploy them against Eastern Rome. 406 - The Great Invasion With Rhineland garrisons evacuated in the recent wars in Italy, three Germanic tribes, the Swabians, the Vandals and the Alans, pressed from behind by the Huns, cross the Rhine border into Roman Gaul. Challenged by the Franks, a Roman federate tribe (settled on the lower Rhine since 358), they are forced to continue marching on. They head on a great trek westwards across Gaul, and into Spain. In their wake, the Burgundians cross over to the left bank of the Rhine and settle in the central Rhineland region (capital: Worms) while the Alemanni (another federate tribe, remnants of the Swabians, centered in sw Germany) take the opportunity to seize the area just below them (Alsace). In the meantime, seeing the chaos in Europe, the Roman commander in Britain declares himself Emperor Constantine III and launches a campaign to seize Gaul. Eventually settles his capital at Arles, while Britain spins away into a squabbling patchwork of Romano-Celtic statelets. 408 - Death of Arcadius of the Eastern Empire. His son as ascend as Eastern Emperor Theodosius II. 408 - Assassination of Stilicho, western Roman regent on orders of Emperor Honorius. His partisans appeal to Alaric for protection. Alaric's Visigoths invade Italy again and force the Roman Senate to appoint a puppet of his own, a certain Priscus Attalus, as rival emperor in Rome. (Honorius remains in control of Ravenna). 409 - Partition of Spain Great invaders arrive in Spain and partition the peninsula between them. The largest tribe, the Alans, got the lion's share, taking Lusitania (Portugal) and Carthaginensis (central Spain), the Silingian Vandals got wealthy Baetica (Andalusia), while the Swabians and Asdingian vandals are huddled into the mountainous Galicia & western Tarraconensis (Asturias). 410 - Visigoth Sack of Rome Going nowhere, ALaric decides to depose Attalus and re-open negotiations with Honorius. But the Roman Senate doesn't cooperate and starts playing divide-and-rule, promoting another Goth, Sarus, a blood-rival of Alaric. In punishment, Alaric's Visigoths besiege, capture and plunder the eternal city. The first sack of Rome by a barbarian tribe. Visigoths subsequently march down Italy, plundering their way to Calabria, where Alaric will die. 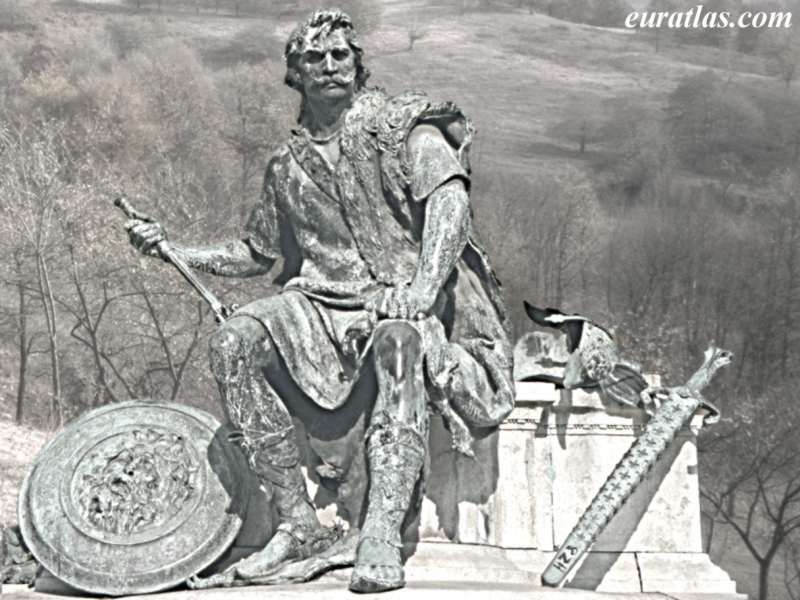 Succeeded by his brother-in-law as high chieftan Ataulf of the Visigoths. 411 Angered by the continued Senate-Sarus alliance, Ataulf of the Visigoths forges a counter-alliance with Emperor Honorius in Ravenna. Gothic auxiliaries help Honorius's army defeat the anti-Emperor Constantine III at Arles and recover southern Gaul (northern Gaul remains in the hands of a new usurper, Jovinus). At Honorius's request, Ataulf's Visigoths leave Italy and move into Provence, keeping the new anti-Emperor Jovinus in check. 413 Ataulf's Visigoths defeat and kill anti-Emperor Jovinus of Gaul. In reward, Ataulf is married to Galla Placidia, a daughter of Honorius. But the jealous Constantius, master of the imperial army, intrigues against Ataulf in the Ravenna court. A break ensues and Constantius's navy blockades Provence, hoping the starve the Visigoths out of there. A betrayed Ataulf moves further westwards and resurrects the puppet Attalus as anti-Emperor in Bordeaux. 415 - King Ataulf is assassinated in Barcelona by the late Sarus's agents. Sarus's brother Sigeric becomes king briefly, until he too is assassinated and a new chieftan Wallia of the Visigoths is elected. 416 - Visigothic Aquitaine Wallia of the Visigoths negotiate peace and alliance with Emperor Honorius. They are given the status of Roman federati and granted Aquitaine as their own kingdom (capital: Toulouse). In return, Ataulf's widow Galla Placida is returned to Ravenna, where she is forcibly married to the imperial general Constantius. 418 - Campaign in Spain At Emperor Honorius's request, Visigoths invade Spain and annihilate the Alans and (Silingian) Vandals. The Swabians and (Asdingian) Vandals, sheltered by their northern mountains, survive the onslaught. Their work largely done, Visigoths return to Aquitaine. In their wake, the Asdingian Vandals descend from the mountains, absorb the remnants of the Alans and set up a new kingdom in Andalusia. 419 - Death of Wallia. Succeeded by his illegitimate son as Theoderic I of the Visigoths. 421 - Imperial general Constantius forces Honorius to appoint him co-emperor, but the arrangement will not last. Constantius will die in 422 and Honorius himself in 423. Ravenna patrician Joannes is elevated as Western Roman Emperor, but at the instigation of Galla Placidia, the Eastern Emperor Theodosius II intervenes and appoints her young son as Western Emperor Valentian III in Rome. Joannes refuses to abdicate and war ensues. Joannes appeals to the Huns for help. 425 - Eastern Roman army invades Italy and besieges Ravenna. Joannes is betrayed and handed over to them for execution. Valentian III rules alone in the West under the regency of his mother, Gallia Placida. As a conciliatory measure, she appoints Aetius, a partisan of Joannes who had returned with Hunnish auxiliaries, as magister militus of the imperial army of Gaul. The Huns are paid and return home. 426 - Death of Vandal king Gunderic in battle against Visigoths, who had been launching incursions into Spain. His half-brother ascends as King Gaiseric ('the Lame') of the Vandals. 428 - Intrigues by Aetius against his rival, the Count Boniface of Africa, an old favorite of the Roman regent Gallia Placida, prompt a Bonifacius to go into revolt. Looking for an army, he invites the Vandals of Spain to come to Africa. 429 - Vandal North Africa Although they fended off a few lackluster Visigothic attacks, the Vandals realize their position in the wide-open plains of Andalusia is not very defensible and should the Visigoths make a serious effort, they might very well likely meet the same fate as their cousins a decade earlier. So the Vandal king Ganseric accepts the invitation from Bonifacius of Africa and moves his Vandals (and attached Alan remnants) en masse out of Spain to Africa. The Swabians stay behind in Galicia-Lusitania. c. 430 Aetius's perfidy is soon brought to light in the Ravenna court, and Bonifacius is reconciled with the Roman regent. The invitation to the Vandals is rescinded, but Gaiseric decides to stay in North Africa regardless and goes on a campaign of conquest. Bonifacius's provincial army is defeated by Vandals, who proceed to corner him and lay siege to Hippo (modern Bona; St. Augustine will perish during the siege). 431 - First Council of Ephesus (Third Ecumenical Council) convened by Theodosius II. Confirmes Nicaea and declares Nestorianism (a christological doctrine asserting that Christ was "two distinct persons", God and Christ moving seamlessly together, not merely two-natures-in-one-person) as heretical. Pelgainism (a doctrine that minimized original sin) is also condemned. 431 - A joint west-east Roman relief expedition arrives in Hippo and is led by Boniface to a disastrous defeat against the Vandals. Boniface slips back to Italy, the Vandals overrun Hippo. Despite his defeat, he is welcome in the Ravenna court and given the honor of patricius, much to Aetius's displeasure. 431 Franks under king Chlodio ventures out into the Seine basin and the middle Rhine. Aetius rushes up and defeats the Franks at the Battle of Hesdin, rolling them back to the Lower Rhine. A federate treaty with the is negotatied and the Frankish kingdom established with their capital at Tournai. 432 - Huns united under the sole kingship of chieftan Rugila. 432 - Aetius raises an army of German auxiliaries in Gaul and crashes down on Italy. A Roman army led by Bonifacius of Africa defeats Aetius at the Battle of Ravenna, but Bonifacius himself is killed. Aetius goes into exile in Dalmatia. 433 Realizing their need for his services, Emperor Valentian III and the regent-empress Galla Palidia restore Aetius from exile and make him patricius of Rome and magister militus of all the imperial army. Aetius thus becomes the de facto ruler of Western Roman Empire. 434 - Death of Hunnish chieftan Rugila. Succeeded jointly by his nephews Attila the Hun and Bleda. 435 - Treaty of Margus Huns agree to stop pestering the Eastern Roman borderlands in return for an annual tribute. 436 - From their Rhineland base, Burgundian raids into Gaul become intolerable. Aetius calls on the help of the Huns, and together they invade the Burgundian kingdom of Worms. Burgundian king Gunther is killed and much of the Burgundians annihilated savagely. Gunderic succeeds as new king. The Burgundian epic, Nibelungenlied, is set around this time. 436 - Visigoths inch eastwards into Provence but are defeated by Aetius at Arles and forced back into Aquitaine. 439 - Vandals capture Carthage and turn it into the new capital of their North African kingdom. Roman Africa is now fully in Vandal hands. 441 - Hunnish Invasion Proclaiming the Eastern empire violated the terms of their treaty, the Huns invade and ravage the Balkans. 442 - Reeling under the Hunnish assault, both the Roman Empires make a swift peace with the Vandal king Gaiseric and recognize the Vandal Kingdom of North Africa. 443 - Aetius resettles the remnant of the Burgundians, led by their chieftan Gunderic, south into the Rhone valley, granting them Sapudia (Savoy) as a homeland under a federate treaty. The Burgundian kingdom will evolve from here. Around this time, remnants of the Alans who had lingered in Gaul are rounded up and concentrated by Aetius north of the Loire (capital: Orleans). 443 Peace of Anatolius. The Huns make peace with East Roman Emperor Theodosius II. Byzantium pays tribute and the Huns withdraw back over the Danube. 445 - Hunnish co-ruler Bleda is murdered by his brother Attila. The Huns are now under the sole leadership of Attila. Seeing the change of leadership as an opportunity, the Romans try to renege on their treaty with the Huns. 446 - "Adventus Saxonum" - The Jutes (a Germanic tribe from Jutland, Denmark) land in Britain, ostensibly as merceneries, hired by Romano-British chieftans to fight off a wave of Irish invasions from the west and Pict invasions from the north. The Jutes will be eventually followed by their neighbors, the Angles and Saxons. 447 Attila invades the Eastern Roman Empire. After two years of havoc, Constantinople sues for peace, reiterating the terms of the peace of 443 and upping the tribute payments. The Huns withdraw. Roman legions under Aetius ambush and defeat the Salian Franks in their Belgian encampment. Their chieftan, Clodion, is killed in the melée. A struggle for succession ensues, with the Romans and Huns backing different candidates. Finally, the Rome-backed candidate Merovech is elected as high chief of the Salian Franks. Beginning of the Merovingian dynasty. Second Council of Ephesus (a.ka. Robber Council, as no Latin bishops participated, so not recognized as ecumenical) overturns the previous year's council and rehabilitates Eutychius. July, 450 - Death of Theodosius II of Eastern Rome. Succeeded by his sister Pulcheria. She picks the general Marcian as her consort, who ascends Emperor Marcian of Eastern Rome. As his first act, he ceases all tribute payments to the Huns. 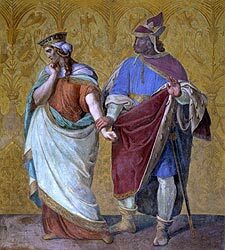 While Attila contemplates his response, he receives what he interprets as a strange offer of marriage from Honoria, the scandal-ridden sister of Western Emperor Valentinian III. Attila betroths himself to Honoria and demands a large part of the Western Roman Empire as dowry. Understandably, he Romans refuse, giving Attila a casus belli. 450 - Death of Gallus Placidia, dowager-empress of Western Rome. The Roman general Aetius is elevated to Patrician of Rome and effective ruler of the Western Roman Empire. 451 - Council of Chalcedon (Third Ecumenical Council), the most thorough ecumenical council of the Christian church to date, reconciling & restating a final and uniform version of Christian doctrine (and condeming all variants as heresies). 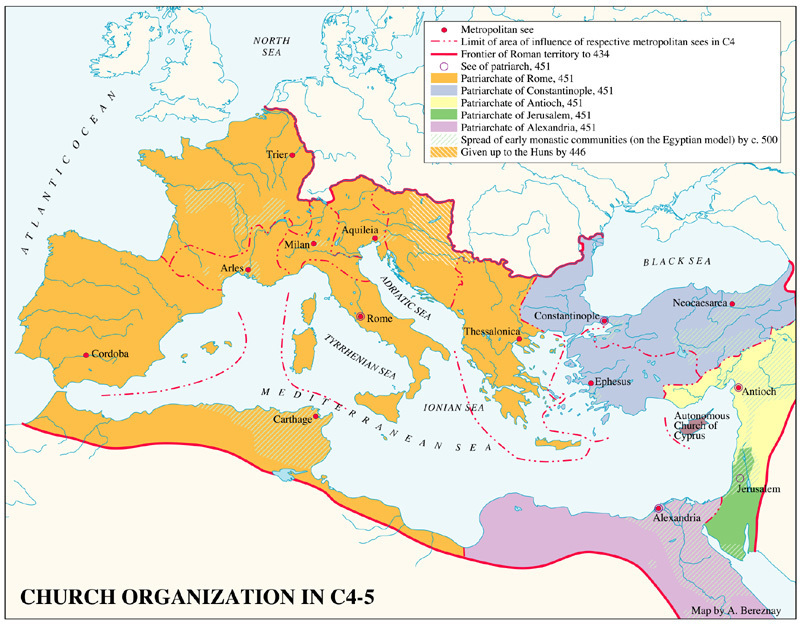 The system of '5 Patriarchates' was finalized here: to the three original patriarchates of Rome (West), Antioch (East) and Alexandria (Africa), were added the patriarchates of Constantinople and Jerusalem, thereby dividing the Christian world into five areas of ecclesiastical organization. 451 - Hunnish Invasion of Gaul - Attila invades Western Roman Empire for the first time, striking through Roman Gaul - informing the Goths there that he is saving them from Rome, and the Romans that he is saving them from the Goths. This does not fool anybody. The Patrician Aetius strikes an alliance the Visigothic King Theodoric I. They assemble a large Roman-Visigothic army and chase Attila from the outskirts of Orleans. The armies finally meet in Champagne at the bloody Battle of the Châlons (or "Catalaunian Fields"). The Huns are defeated and withdraw back into Germany. 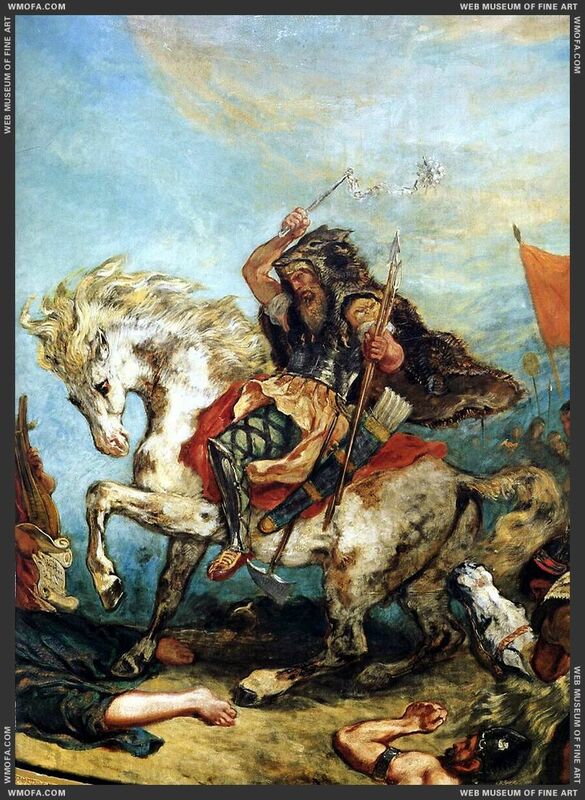 The Visigothic chieftan Theoderic I is killed on the battlefield, replaced by Thorismund. 452 - Hunnish Invasion of Italy Attila's Huns invade the West for the second time, this time ravaging northern Italy, sacking Aquileia, Vicenza, Verona, Brescia, Bergamo and Milan, before heading down the peninsula towards Rome. Unthreatened, the Visigoths in Gaul refuse to come to the rescue of Italy, leaving Aetius to face the indomitable Attila alone. Unable to do battle, the Romans negotiate, plead and pay. Attila withdraws, sparing Rome at the personal request of Pope Leo I the Great. Streams of refugees from northern Italy (esp. Aquileia), escaping the Hunnish onslaught, pour into the relative safety of the hitherto sleepy Venetian lagoon and marshlands, laying the seeds for the rise of the Venetian republic. 453 Death of Attila, fearsome leader of the Huns, in a drunken stupor on the night of his marriage. His numerous sons dispute the succession and the Hunnish hordes partition. However, the partition is not welcomed by their German vassals -- who, probably correctly, feel that their own powers as tribal chiefs will be diluted. The Gepid chieftan Ardaric forges a confederation of vassal Germanic tribes (notably Gepids, Heruli and Rugi) against their Hunnish overlords. The powerful and popular West Roman patrician Aetius is assassinated by Emperor Valentinian III in a fit of jealousy. The German confederates under Ardaric of the Gepids defeat the bulk of the Huns at the Battle of Netad. The Hunnish empire dissolves overnight. The area is partitioned among the Gepids, Swabians, Sciri, Heruli, Rugians, Sarmatians, Antes (Slavs), etc. The Ostrogoths, who had unwisely sided with the Huns in this war, fear reprisals from the other tribes. With the Eastern Emperor Marcian's permission, the Ostrogoths cross the Danube border - one group settling in Pannonia, another in Thrace - as federates of the empire. Vandal Sack of Rome Valentinian III is assassinated by his bodyguards in March. By bribery and persuasion, the new patrician Petronius Maximus forcibly marries the widowed Empress Eudoxia and ascends to the imperial throne of the West. But Empress Eudoxia appeals to King Gaiseric of the Vandals for deliverance from her new husband, who immediately sets sail. Hoping to forestall the impending Vandal attack, the Emperor Petronius Maximus is murdered by his own subjects in May. The Vandals land a few days later and proceed to leisurely sack Rome thoroughly in a fortnight, taking Eudoxia and her family (together with all the plunder they could carry and thousands of slaves) back with them to Africa. The entreaties of Pope Leo I save Rome from being put to the flame and sword. In the meantime, the Romano-Gaul Avitus is proclaimed Western Roman Emperor in Toulouse by the Roman army of Gaul and the Visigoth federates. After much negotiation, Avitus receives official recognition from Eastern Emperor Marcian. Swabian War - In their capacity as federates, the Visigoths attack the Swabians, who had been venturing over their prescribed borders in northern Spain. The Swabians are defeated at Urbicus River and their lands ravaged by the Visigoths. Horrified by the reports of the depredations upon his tribesmen in Spain, the Romano-Swabian general Ricimer, returning from a victorious naval campaign against the Vandals, deposes the Visigoth-backed Emperor Avitus and takes control of Rome. The Visigoths break off their campaign in Spain and rush back to Gaul. At the urging of the Roman Senate, Eastern Emperor Marcian confirms Ricimer as Patrician of Rome and accepts Ricimer's favorite, Majorian, as Western Emperor. The Visigoths, Burgundians and the Roman army of Gaul refuse to recognize him. 458 - Western Emperor Majorian invades Gaul, hoping to subdue the rebellion against his rule. Loyal general Aegidus takes control of the Roman army of Gaul, the Visigoths are expelled from Arles and the Burgundians from Lyons. However, having demonstrated his might, Emperor Majorian offers conciliation. As part of the deal, he cedes Sequania (Upper Burgundy) to the Burgundians. c. 460 - Monophysite Heresy - Growth of the monophysite heresy (a christological position that the divine and human natures of Christ had fused into "one nature", a conclusion derived from the Eutychianism condemned at the 451 Council of Chalcedon, which had insisted on the 'catholic' doctrine that the two natures were comingled, not fused). The monophysite heresy was particularly popular in Africa and the East. Over the next couple of decades, three of the five patriarchates - Alexandria, Antioch and Jerusalem - would embrace Monophysitism, leaving only Rome and Constantinople to uphold to the Chalcedonian. 460 - Annoyed at the continued Vandal raids in the Mediterranean, West Roman Emperor Majorian prepares an invasion of North Africa. A Roman expeditionary force is assembled at Cartagena (Spain), but, in a pre-emptive strike, the Vandal navy ambush and destroy the entire Roman fleet at the Battle of Cartagena. Majorian sues for peace and formally cedes Tripolitana (Tunisia) and Mauritania (south Spanish coast) to the Vandals. 461 Romano-Swabian patrician Ricimer uses the failure at Cartagena to have Majorian deposed and killed (August). He appoints a puppet to replace him, West Roman Emperor Libius Severus. Both the Eastern Empire and the Roman Gaul (led by general Aegidius) and the Visigoths refuse to recognize the new emperor. At the same time, arguing that deposition of Majorian invalidates their peace treaty, the Vandals step up their piracy and raiding campaigns in the Mediterranean. 461 Eastern Emperor Leo I makes peace with the Ostrogoths of Pannonia, who had gone into rebellion. Theodoric, a son of the ruling Ostrogoth clan, goes to Constantinople as hostage. November, 461 Death of Pope Leo I. He is succeeded by a Sardinian archdeacon as Pope Hilarius. Continues the policies of his predecessor, most notably enforcing ecclesiastical hierarchy and discipline in other dioceses in the west and opposing the growing monophysite heresy. His papacy will be focused on reconstructing the churches in the ruined city of Rome. 462 - new Emperor Libius Severus cedes Narbonne to the Visigoths, hoping to win them over. Although the Visigoths agree to prevent Aegidius from marching on Rome, they let him take control of Gaul nonetheless. 465 - August, Death of West Roman Emperor Libius Severus. A brief interregnum ensues. Rome remains under the rule of the Romano-Swabian general Ricimer. In the east, Aspar the Alan becomes patrician around this time. 466 - Venetian Confederation. Representatives of the twelve refugee communities of the lagoon and salty marshlands of the northern Adriatic meet at an assembly at Grado and establish rudimentary system of self-government, via twelve tribunes, elected annually by each of them. The twelve communities are Sottomarina and Chioggia (on the western edge of thelagoon, refugees from Adria), Malamocco (on Lido island, the main barrier island, principal settlement of refugees from Padua), Poveglia (islet between Lido & Rialto), Rialto (central Venetian islands), Murano (island just east of Rialto), Torcello (island a bit east of Rialto, refugees from Altino). On the eastern coast of the lagoon, there was Jesolo (on the Sile tributary of the Piave) and Heraclea (originally Cittanuova, on the Piave river, main settlement for refugees from Oderzo). Further eastwards is Caorle (island further east up the coast, refugees from Concordia), Bibione (on the mouth of the Tagliatone river) and Grado (island off Friulian coast, main settlement of Aquilean refugees). April, 467 Anthemius, supported by eastern army dispatched by Emperor Leo I, seizes the Western throne and is acclaimed as Western Emperor. After some resistence, Ricimer accepts. 468 - Death of Pope Hilarius I. Election of Pope Simplicius. 468 Danubian War between Eastern Rome and the resurgent Huns. Ostrogoths assist the Romans. Simultaneously, a naval war breaks out between the Vandals and Eastern Rome. Raiding fleets are sent both ways. 470 - Roman fleet destroyed by the Vandals. Looking for someone else to blame for the disaster, West Emperor Anthemius goes on a rampage and falls out with Ricimer. Multi-faceted civil war envelops the west. 471 - Ostrogoth Ascendancy A palace coup led by Zeno the Isaurian, head of the Syrian guard, leads to the fall of the increasingly ambitious eastern patrician Aspar the Alan. Aspar's nephew, Theodoric Strabo ('One-Eyed'), head of the Thracian Ostrogoths, goes into rebellion against the coup leaders. Emperor Leo I appeals to the Pannonian Ostrogoths (under Theodomir) for assistance. Theodomir moves against the Sarmatians (then settling in around Belgrade), but do little else. 472 - (July) Ricimer captures Rome and executes Western Emperor Anthemius, who is replaced by Emperor Olybrius, a candidate favored by the Vandals. Two months later, Ricimer himself dies. His nephew, the Burgundian prince Gundobad becomes Patrician of Rome. 473 (March) Death of Western Emperor Olybrius. Roman Patrician Gundobad raises a Roman native as Emperor Glycerius. After his own father's death later that same year, Gundobad quits his Roman post to take up the kingship of the Burgundians together with his brothers. Glycerius, without eastern recognition, tries to rule alone. 473 Cornered, Emperor Leo I succumbs and buys peace from Thracian Ostrogoth Theodoric Strabo, appointing him magister militus of Eastern Rome and head of all the Ostrogoths (Pannonians incuded). Simultaneously, with their lands falling into famine and pressure from the Heruli, the Pannonian Ostrogoths migrate south into Moesia (Serbia). Part of this group tries to migrate west into Italy, but is fended off by Emperor Glycerius. (January) - Death of Eastern Emperor Leo I, succeeded by his grandson Leo II. But the boy's father, Zeno (captain of the Isaurian guard) kills him and seizes the throne as Emperor Zeno ('the Isaurian') of Eastern Rome. Seeking to seize control of the western half, Emperor Leo I had dispatched his nephew, Julius Nepos (governor of Dalmatia), to Italy. Nepos lands in Ostia (near Rome) with a large army in June, 474. Glycerius surrenders and Nepos becomes emperor. 474 Vandal Peace. After a successful naval campaign, Ganseric of the Vandals forces Emperor Zeno to make peace. Vandal kingdom is recognized to include the Roman provinces of Africa, the Balearic Isles, Pithecusae, Corsica, Sardinia, and Sicily. In return, Genseric promises to preserve freedom of religion for Catholics under Vandal rule. Vandals redirect their pirate raids towards Italy. 474 Death of Theodemir, king of the Pannonian Ostrogoths. His son, the former hostage prince, Theodoric the Great inherits the Pannonian Ostrogoths. But his claim to kingship is not recognized by the Eastern Emperor, who had given it to his relative Theodoric Strabo of the Thracian Ostrogoths as part of the peace of 473. January, 475 Intrigues by the dowager-empress Verina with Ostrogoth Theodoric Strabo prompt Emperor Zeno to flee to his Isaurian homeland. The Isaurian guard is massacfed by the populace of Constantinople and a new Emperor Basiliscus raised. 475 Kingdom of the Visigoths. Visigoth chieftan Euric I negotiates a deal with Emperor Julius Nepos where, in return for the Provence region of Gaul, the Western Emperor recognizes the independence of the Kingdom of the Visigoths, with capital at Toulouse and covering most of southern France and Spain. The Visigothic chieftan styles himself as King Euric I of the Visigoths, and compiles one of the first written legal codes among Germanic tribes. August, 475 With Germanic support, Roman general and new patrician Orestes deposes Julius Nepos and raises his own son to the throne, as Western Emperor Romulus Augustulus. The rival eastern emperors Basiliscus and Zeno refuse to recognize him, but they are engaged in a war against each other and can't do much about it. Julius Nepos flees to still-loyal Dalmatia, where he continues to use the imperial title. Orestes reliance on Germanic mercenary tribes - the Heruli, Rugi and others - quickly drains the treasury. 476 Backlash against Basiliscus begins as he manages to alienate everybody around him - notably, by issuing an edict condemning the Council of Chalcedon and supporting the Monophysite heresy. Zeno the Isaurian is invited back and restored as emperor in August. Basiliscus and other intriguers are killed. Theodoric Strabo (of the Thracian Ostrogoths) is stripped of his titles, which are passed on to Theoderic the Great (of the Pannonian-Moesia Ostrogoths). 476 - August/September - End of Western Roman Empire. The Heruli, Germanic federates in the west Roman army, revolt against their paymasters. Their chieftan Odoacer defeats and kills Orestes at Piacenza and then deposes his son, the last Western Emperor Romulus Augustulus. Instead of appointing another Emperor, Odoacer ships the imperial regalia to Constantinople with a petition to be appointed dux of Italy. East Roman Emperor Zeno the Isaurian accepts the request and grants Odoacer the title of Patricius of Rome. At Zeno's insistence, Odoacer recognizes Julius Nepos, then exiled in Dalmatia, as Western Emperor, but refuses him entery into Italy. To his own Heruli men, Odoacer styles himself as 'King of Italy'. Sygarius, the son of the rebellious Gallo-Roman general Aegidius, refuses to recognize the new ruler and declares his state in Neustria (northern Gaul) as the independent "Kingdom of Soissons". - ex-Roman Emperor Julius Nepos remains in control of Dalmatia. - Roman general Sygarius (son of Aegidius) carves out an independent Romano-Gallic state in northern Gaul (Neustria) (capital: Soissons). - ex-Roman Emperor Julius Nepos carves out his own state in Dalmatia. 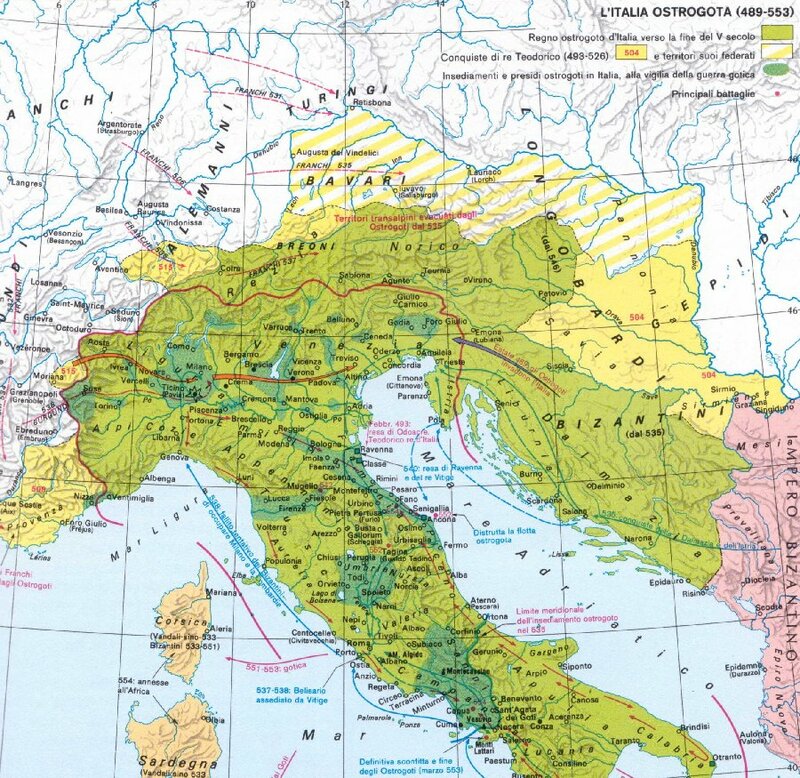 - The Heruli (led by Odoacer) establish their kingdom in Italy. - The 'Salian' Franks, an old federate tribe, led by chieftans of Merovingian dynasty, establish their kingdom in the Lower Rhine (Belgium, etc.). - the Alemanni (a collection of Swabian tribes) found their kingdom in upper Rhine (Alsace & sw Germany). - the Burgundians establish a kingdom in the region of the Rhone valley (se France). - Chieftan Euric I of the Visigoths, a federate tribe, founds the Kingdom of the Visigoths (capital: Toulouse) covering most of southwest France and nearly all of Spain. - the Suevi (Swabian migrants), maintain their kingdom in northwestern Spain (Galicia). - The Vandals (led by Ganseric), old enemies of Rome, hold on to north Africa, and the Mediterranean islands (Baleares, Corsica, Sardinia, Sicily). - the Ostrogths, a federate tribe under their chieftan Theoderic the Great, establish their kingdom in western Pannonia (west Hungary/Serbia). There is another Ostrogothic tribe concentrated in Thrace, led by Theodore 'Strabo' (one-eyed). - the Saxons establish their homelands in northwestern Germany. - the Rugians establish themselves in Bavaria/Bohemia. - the Lombards establish themselves in upper Vistula (southern Poland/Slovakia). - the Frisians establish themselves in the northern fringes of the Netherlands. - Romano-Celtic Britons cross the channel and establish mini-states in Brittany. - Irish Celtic tribe, the Scotti, cross the sea and establish kingdom of Dalraida (west Scotland). Ostrogoth-Byzantine War Unable to finance two Ostrogothic federates - Theodoric the Great (of the Pannonian Ostrogoths) and Theodoric Strabo (of the Thracian Ostrogoths) - and unable to persuade either to dismantle their armies, East Roman Emperor Zeno tries to pit them against each other, bribing one to attack the other. By and large, the strategy fails - and at great cost. The Ostrogothic armies turn against Zeno in turns. Theoderic the Great ravages Greece, while Theodoric Strabo goes on a rampage in Thrace. Strabo also foments palace intrigues to depose Zeno. April, 480 Ex-Emperor Julius Nepos is murdered by his own soldiers. The Heruli invade Dalmatia, adding Nepos's domains to their Italian kingdom. 482 - Henoticon edict issued by Emperor Zeno, at the suggestion of Patriarch Acacius of Constantinople. In an attempt to reconcile the Catholics (Rome and Constantinople) and Monophysites (Alexandria, Antioch and Jerusalem, then being dangerously lulled by Persia). Zeno asserts that the 381 version of the Nicene creed is a sufficient and only instrument of faith, lauds previous councils (some more than others - Chalcedon is only faintly praised, but its condemnations confirmed). In particular, it makes no explicit assertion over whether Christ's nature was single or dual, thereby leaving the matter unresolved. That satisfies neither party. 483 The death of Theodoric Strabo in a freakish accident prompt Thracian Ostrogoths to pass under the leadership of Theoderic the Great. Emperor Zeno makes peace with the Ostrogoths, granting Theoderic the Great the titles of magister militum and consul of Rome and grants his Ostrogoths a large homestead in Moesia and Dacia. 483 - Death of Pope Simplicius. Election of a Roman nobleman as Pope Felix III. 484 - Acacian Schism Seeking to enforce the 482 Henoticon, Emperor Zeno and Patriarch Acacius of Constantinople allow the persecution of clergy who refuse to accept it, and confirm those who have. Two prominent monophysites, Peter Mongus and Peter the Tanner, are allowed to seize the patriarchates of Alexandria and Antioch respectively. The Pope Felix III condemns both seizures, but Acacius refuses to condemn Mongus (who had accepted the henoticon). When the Pope dispatches a legation to Constantinople to get an explanation, the Patriarch seizes the legates and forces them to attend a monophysite-riddled mass and lecture. Felix III excommunicates Patriarch Acacius, thus leading to the first open schism between the Western and Eastern churches. 485 The new favoritism Zeno showered on Theoderic prompt the powerful Byzantine general Illus the Isaurian to go into revolt against Zeno. Illus raises an army in his Antioch stronghold, and appeals to Odoacer of the Heruli and the Persians for assistance. 486 - Franks conquer Neustria Clovis, chieftan of the Salian Franks, unites the Frankish armies and defeats Sygarius. Franks annex the Gallo-Roman kingdom of Soissons (northern France). 487 - From their homelands in Bohemia, the Germanic tribe of the Rugians cross the Danube into Heruli territory. But Odoacer crushes them so thoroughly that they disappear from history. Their domains in Bohemia pass to a loose confederation of Rugian-Marcomanni-Swabian remnants known as the Bavarians. Demanding more money and land, Theodoric the Great has a fall-out with Emperor Zeno and proceeds to occupy the outlying provinces of Constantinople and cut off the water supply to that city. Zeno realizes a new, permanent solution must be found for the perennially-prolematic Ostrogoths. As Heruli of Italy have been in intrigues with eastern rebels, Zeno figures he can kill two birds with one stone by dispatching the Ostrogoths against them. 488 - Ostrogoth Invasion of Italy At the behest of Eastern Roman (Byzantine) Emperor Zeno, chieftan Theodoric the Great of the Ostrogoths, assembles his army and heads towards Italy. Heruli allies, the Gepids send a force westwards to block his path, but are defeated by Theodoric's forces near Sirmium (Belgrade). 489 Theodoric's Ostrogoths enter Italy and defeat Odoacer and the Heruli at the Battle of Isonzo, followed up by another victory at the Battle of Milan..
490 Ostrogoths defeat the Heruli remnants at the Battle of Adda River. 491 Death of Emperor Zeno the Isaurian without a heir. Infighting between various factions as the try to seize the throne. The immediately successful candidate is the openly monophysite Emperor Anastasius I. The Isaurian rebels will continue fighting him until 498. March, 492 - Death of Pope Felix III. His African secretary is elected as Pope Gelasius I and will continue his predecessor's policies. The chances of healing the schism with the Patriarch of Constantinople are made more difficult by the openly monophysite Emperor Anastasius. 493 Ravenna falls to the Ostrogoths. The Heruli king Odoacer is killed by Theodoric himself. 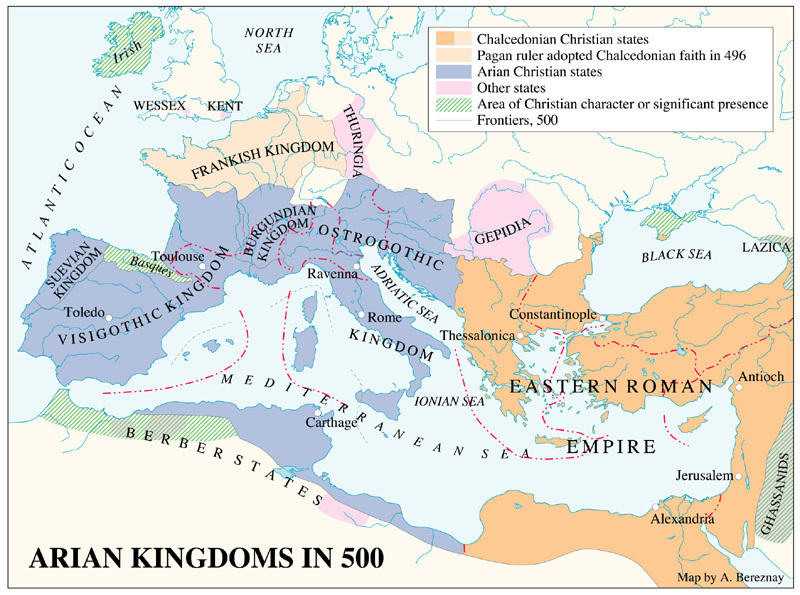 Formation of the Kingdom of the Ostrogoths in Italy, with capital at Ravenna. Technically, Theoderic is a "vice-roy" of Italy, on behalf of the Emperor. Romano-Italians are subject to Roman Law, while Ostrogoths are under their own tribal law. 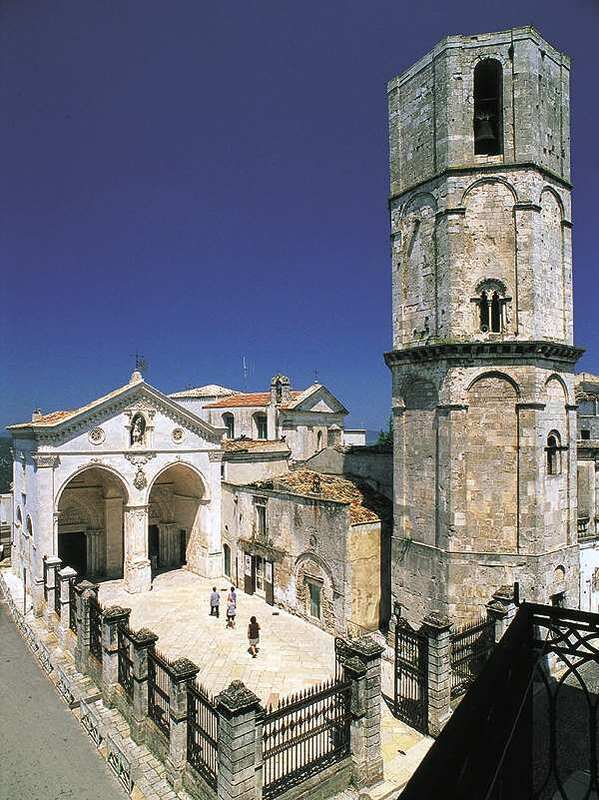 493 - Monte Sant'Angelo of Gargano - Alleged apparition of Archangel Michael before Bishop Laurentius of Siponto in a grotto in Monte Gargano (in the 'anklebone' of the Italian boot). The shrine "for all the angels" subsequently built on the spot will become a major pilgrimage site in Medieval Italy. 494 - Pope Gelasius I issues his famous letter, Duo sunt, elaborating the doctrine of relationship between church and state, claiming that ecclesiastical and royal power have distinct and separate spheres of operation, that neither is reducible to the other. They are, however, harmoniously co-dependent, royal authority resting on religious justification, and ecclesiastical authority dependent on the royal executive power. This church-state doctrine will prevail in the west for much of the next millenium. c.495 In the wake of the Ostrogoth invasion of Italy, another Gothic tribe, the Gepids move west into the evacuated territory of southern Pannonia (Serbia) and establish their capital at Sirmium (Mitrovica). Streams of Heruli refugees are absorbed by the Gepids. 496 Franks conquer Alemannia King Clovis I of the Franks defeats the Alemanni at the Battle of Tolbiac. The Kingdom of the Alemanni (Alsace-Swabia) is annexed by the Franks. November, 496. Death of Pope Gelasius I. Election of Pope Anastasius II. More conciliatory than his predecessors, his disposition to make concessions to heal the Acacian schism makes him unpopular in Rome. December, 496 Conversion of the Franks Sticking to a vow made before the battle of Tolbiac, Frankish King Clovis is baptized according to the Catholic rite at Reims. November, 498 Death of the unlamented Pope Anastasius II. Election of Pope Symmachus, a hardline defender of orthodoxy. But a faction of pro-Byzantine clerics elect anti-Pope Laurence, the candidate favored by Emperor Anastasius I. Theodoric the Great breaks the deadlock by confirming Symmachus in the Lateran palace. Laurence is bought off with a bishopric in Nocera. 502 - Palmary Synod Roman Senators lodge accusations against Pope Symmachus and call on Theodoric to serve as judge. The Pope refuses the indictment, asserting that secular rulers have no jurisdiction over bishops. In a raucous synod assembled that Fall, Symanchus's jurisdictional claim is endorsed. Theodoric nonetheless rejects the decision and allows the Pope's opponents to dig out former anti-Pope Laurence and install him in the Lateran Palace and seize all the Roman churches. 503 Byzantine-Persian War breaks out. With Constantinople distracted, the Ostrogoths in Italy are pretty much left to their own devices. They immediately forge an alliance with their long-lost cousins, the Visigoths. 504 - Ostrogoth-Gepid Wars Unwilling to see the Gepids (now bolstered by Heruli remnants) entrenched so close to them, the Ostrogoths strike east and, with quite some difficulty, conquer Pannonia and push the Gepids back over the Danube. 506 - Worried about the pro-Byzantine tendencies of anti-Pope Laurence and his party, Theoderic the Great switches sides and restores Pope Symmanchus in Rome. 507 - Frankish-Gothic War Clovis I and the Franks invades and defeat the Visigoths and their Ostrogoth auxiliaries at the Battle of Vouillé (Campus Vogladensis). The bulk of the Visigothic territories in southern France -- basically, Aquitaine -- are annexed by the Franks. Visigoths retain control of the southern coastal lands of Septimania (Narbonne) and Provence. 511 Partition of Francia - Death of King Clovis I of the Franks. Frankish lands are divided among his four sons. Gothic Union. Death of Visigothic king Gesalec. Ascension of the young King Amalaric of the Visigoths, under the regency of Theodoric the Great of the Ostrogoths. Visigoths & Ostrogoths are effectively united. To secure their connection, the thinly-held Visigothic duchy of Provence is annexed into the Ostrogoth kingdom. 514 - Death of Pope Symmachus. Ascension of Pope Horsmisdas. 518 Death of Anastasius I without heirs. Ascension of the captain of the guard as Byzantine Emperor Justin I. 518 - End of Schism between Rome and Constantinople. 523 Death of Hormisdas. Ascension of Pope John I. 526 Death of Pope John I in captivity in Ravenna. Theoderic's preferred candidate is elected as Pope Felix IV. 526 - Death of Theodoric the Great, King of the Ostrogoths and regent of Visigoths. The Gothic union is dissolved as his ward, Amalaric of the Visigoths, assumes the Visigothic throne. His grandson ascends as Athalaric of the Ostrogoths, under the regency of his mother (Theoderic's daughter) Amalaswintha.